I discovered my Civil War ancestors in the charming village of Danville, Vermont. 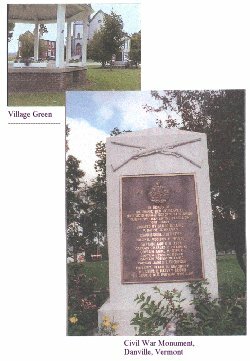 There, on the Village Green, in the middle of town, was a monument dedicated to those brave men who fought in the War of the Rebellion. Much to my excitement, I found my great-grandfather William Bray's brothers listed there as privates and the search was on. Henry Michael Bray was born in Granby, Quebec, Canada, on January 10, 1863, while his brother, Thomas Edward Bray was born 14 months late, on March 5, 1844. They were the second and third children born in the family of Michael and Mary Ann Farrell Bray. Eight of the ten Michael Bray children were born in Canada, with the last two born on the family farm in North Danville, Vermont. Henry was just a little over 21 years old when he and his younger brother, Thomas, who had just turned twenty, enlisted in the War of the Rebellion. they were volunteers in the 17th Regiment Vermont Infantry, Company G., enlisting on March 31, 1864, and mustered in on April 12, 1864, in Burlington, Vermont, leaving under the command of Lieut-Colonel Charles Cummings. On reaching Alexandria, VA, they were assigned to the Second Brigade, under Colonel Simon G. Griffin, Second Division under General R. B. Potter, Ninth Corps, under General Burnside. According to National Archive Records, they were both about 5 ft 6 in tall, with brown hair and eyes. The were each paid a bounty of $60.00 with $250.00 due. Both were farmers. By war's end, one brother was a corporal, the other, considered a deserter. Henry fought with honor in the following battles: Wilderness, VA, May 6-9, 1864; Spotsylvania, VA, May 12-15, 1864; Spotsylvania, VA, May 31, 1864; Bethesda Church, VA, June 3, 1864; during this battle, Henry's brother Thomas was seriously injured in the upper thigh by a minie ball. Henry carried him to the rear of the line so he could receive medical attention immediately. Cold Harbor, VA, June 7-8, 1864; Petersburg, VA, June 17, 1864 and Petersburg Mine, VA, July 30, 1864. Henry Bray was captured and taken prisoner by the Confederates at the Battle of the Crater, outside of Petersburg, VA on July 30, 1864. Here, Union volunteers, mostly Pennsylvania coal miners, had dug a 510 ft long mine shaft that ended beneath the Confederate line. Quietly carrying out tons of sod in cracker boxes, the Union men packed the shaft with 4 tons of black powder, which, when ignited, created a 170 x 60 ft crater 30 ft deep. Frank Kenfield's article, Captured By Rebels: A Vermonter At Petersburg, 1864, describes what took place after the explosion. "The whole earth seemed to sink beneath our feet. The air was filled with men, timbers, dirt and everything the fort contained. It was beyond description. The evening of the capture no food or water was given to the prisoners; no shelter and no blankets; they were crowded on a stone littered field to sleep. The next morning these prisoners were marched into the city of Petersburg in a most humiliating manner. The order was given for Union officers to fall in 4 abreast, then 4 Negroes, continuing in that way until there were no more troops. As so there was an alternate file of whites and blacks who were marched through the main streets of the city, receiving many taunts and scoffs, including one from an old woman who yelled, 'birds of a feather will flock together.' That evening some raw bacon was given and finally, water. Within the next day or two, the prisoners were transported to prisons where the usual ration was corn-meal and sorghum; a small amount to each man twice a day. It was not even half of what each required for sustenance." All that was left of them. Of the 120 men from the Seventeenth VT, 74 were killed, wounded, or captured. According to National Archive Records, Henry was captured at Petersburg, July 30, 1864, held prisoner in Richmond, VA, then on September 11, 1864 was admitted to "Yankee Hospital NO. 21" in Richmond, VA, (which was partially a prison hospital) where he was diagnosed with dysentery, rheumatism and scurvy. He was paroled at Varina, VA, on September 24, 1864, then transferred to Camp Parole USA Hospital near Annapolis, MD. He was furloughed in October and then, because of Dr. H. S. Brown's written request stating that Henry was unfit for service, his furlough was extended for another 30 days. It appears that after his furlough expired, Henry left VT and went to Granby, Quebec, where his grandmother, Mary Berrigan Bray, was living. It is important to note that the exchange of prisoners halted in 1863, mainly because of Confederate refusal to exchange black prisoners. Those released on parole promised not to take up arms until formally exchanged. (Taken from Battle Cry of Freedom, pg. 791 & 792, by James M. McPherson.) I can find no evidence that Henry was formally exchanged and believe he acted as a person of honor by not taking up arms after his parole. He was, however, considered to be a deserter. On March 11, 1865, President Abraham Lincoln issued a Proclamation Offering Pardon to Deserters, with the proviso that each person reporting themselves to a Provost Marshal by the 10th day of May 1865, shall be pardoned, on condition that they return to their regiments and serve the remainder of their original term of enlistment and in addition, a period equal to the time lost by desertion. National Archive Records document Henry's whereabouts. Henry's name appears on a Descriptive List of Deserters on which is handwritten that "he started from Canada May 1/65 and came to St. Johnsbury, Vt., May 3 and left the (railroad) cars to go to his father's (farm) in North Danville, where N. I. Pike deputy sheriff arrested him and brought him to this station and claims $30.00 bounty." He was given a ticket to go by railroad to Draft Rendezvous, New Haven, CT and arrived there May 6, 1865. An Individual Muster-Out Roll of Henry M. Bray, private, 17th Regiment VT Infantry, age 21 years, states that he was mustered-out May 12, 1865, at New Haven, CT. Under remarks, the following is handwritten: Deserted December 13, 1864. Reported voluntarily to Gilman Henry, Captain and Provost Marshal, 2nd Congressional District Vermont, 5 May 1865, in accordance with the terms of the President's Proclamation dated 11th arch 1865. To forfeit all pay and allowances due at the time of desertion or which may have accrued since." By the time of Henry's muster-out, Lee had already surrendered at Appomattox Courthouse (April 9, 1865). Henry returned to Vermont and worked for the Fairbanks Scale Company, in St. Johnsbury, VT. here he met Helen Jane Hughes, who became his wife on March 4, 1867. they farmed in North Danville until 1869, when they moved to Grinnell, Iowa. The became the parents of four children: Florence, born January 11, 1862; Edward J., born August 6, 1873; Katherine, born December 15, 1874, and William H. born January 29, 1878. Twenty-five years after his discharge from the Army of the Rebellion, on October 9, 1890, Henry applied for an Invalid Pension, during which time he was duly sworn in and testified under oath that he had been honorably discharged at New Haven, CT, May 12, 1865. In the Examiner's Brief, under Facts Proven, service and discharge, are written. I believe that he wanted to make certain that his name had been cleared and that this was an attempt to do just that. He did not pursue the claim. He had no reason to do so; he was by that time 47 years old and a wealthy man. the following quotes are taken from Henry Michael Bray's obituary in the Grinnell Herald, Friday, July 9, 1926: "Mr. Bray entered the livestock business and became one of the leading shippers of the middle west. He also owned many large farms and accumulated much wealth. No one ever heard Mr. Bray speak a harsh word. Gentle, kind, and generous, he tempered his daily activities with the spirit of the broadest humanity." "Henry Michael Bray died of a second stroke, followed by pneumonia at 7:30 o'clock, July 7, 1926, at the home of his daughter, Mrs. M. W. Swisher, at the age of eighty-three and a half years. 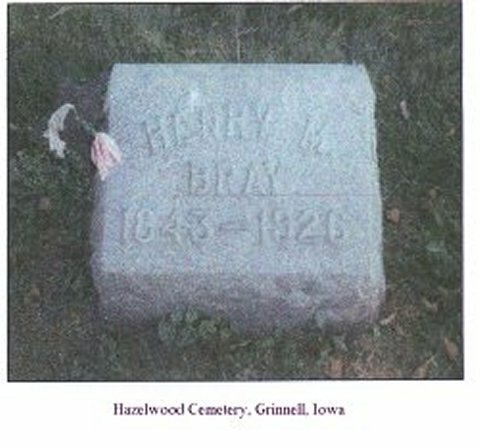 He is buried next to his wife in Hazelwood Cemetery, Grinell, Iowa. He was a member of the City Council of Grinnell for many years, a member of the Grand Army Post in Grinnell, of the Elks Lodge and of the Odd Fellows." "When a pioneer dies, whose life has been marked by industry, thrift, good deeds and honest living, a thrill of sadness passes over the community in which he has lived for so many years. If this reporter were to add his last testimony to the life of a man whose activities were varied, whose success was unquestioned, and whose life was one of honor and worth, we should say that here rests a man of real fortitude and strength of character with the tender and gentle heart of a woman." When a pioneer dies whose life has been marked by industry, thrift, good deeds and honest living, a thrill of sadness passes over the community in which he has lived for so many years. Henry M. Bray and his young and worthy wife came to Grinnell in 1869. They located for a year on the Dr. Lewis farm west of Grinnell just over the county line. For a few years they lived on the Baily farm about three miles north-east of the business center of Grinnell and then Mr. Bray bought the large farm which he conducted until 1882 with great success. He was fond of stock and although he came from a locality where the chief product of the soil was rocks, where the ground barely gave the farmer a reasonable subsistence, he early appreciated the delights of stock farming and during his years on the large farm now known as the Mehlin farm, he gave his attention to raising and shipping stock. He was a successful farmer and his wife was an able helper to him in forwarding his plans for success and competence. Henry M. Bray was born in Granby, province of Quebec, January 10, 1843. He died at 7:30 o'clock, July 7, 1926 at the home of his daughter, Mrs. M. W. Swisher, at the age of nearly eighty-three and one-half years. He was the second member of a family of ten children, two of whom died in early life. When he was ten years old his parents moved to Danville, Vermont, where he was raised and educated. In the winter of 1863 he enlisted in Company G, 17th Vermont Infantry, serving until the close of the war when he received his honorable discharge. With his brother, Tom, he was in the Army of Virginia and took part in many of the hardest fought battles, among which were the Wilderness, Spotsylvania Court House, Cold Harbor and in the battles around Petersburg. In one of these battles his brother, Tom, was seriously wounded and Henry took him and made his way through shot and shell to the rear of the lines where he was cared for and finally recovered. At Petersburg, Henry was taken prisoner and was confined in Libby prison for several months. It will be noted that he enlisted when he was just past twenty years of age and was still a young boy, but he was imbued with the patriotic fervor of many another hardy youth of the north and risked his life in defense of the Union which he had learned to love though only as a resident of this country for ten years. When he returned from the war, he entered the employ of the Fairbanks Scale Company, then well known and reliable manufacturers of platform scales and now one of the great manufacturing plants of the country. During his two years employment in St. Johnsbury, he met the estimable lady who became his wife March 4, 1867, Miss Helen J. Hughes. They started on a farm near Danville where they lived for two years. However, the disadvantages and the lack of opportunity in the old home place were irksome to the ambitious young couple and in 1869, after two years of attempting to make the soil yield them a suitable return for their labors, they packed up and came to Grinnell, Iowa. Just what influence brought them to this little town on the prairie, is not known. But after only a few years of hard labor and the practice of economy, they were enabled to buy the large farm which was recognized as one of the best in the community. After moving to Grinnell in 1882, Mr. Bray entered into partnership as a shipper of livestock with Stillman Needham, one of the best known stock buyers in this vicinity. Mr. Bray himself had an aptness for the business, although he had had but a few years opportunity to acquaint himself with the needs of the Chicago market. He at once jumped into prominence as an appraiser of the weight and value of stock and became at once one of the leading shippers of the middle west. Afterwards C.L. Roberts, well known Grinnell man, became a member of the firm and later when the other and Mr. Bray separated partnership, his son became a member of the firm and the business was conduced under the name of Bray & Son. However, the son entered other business and for years Mr. Bray was a shipper in his own name. Mr. Bray was a man of great sagacity. He foresaw what many another man had failed to note that there was a great future for this country. Although his main business was the shipping of stock he also became the owner of many large farms and accumulated for those days what was considered much wealth. Although the last few years he has been on account of his age and gradually failing strength, not so active in business as in the years before, he was recognized as a man of good judgment whose advice was sound and many a young man has profited by the friendly words of Mr. Bray. In his home life Mr. Bray was almost a perfect man. In his public life, as member of the City Council of Grinnell, he was recognized as a man of good judgment, of public spirit and of keen foresight, and was ever and always willing to do that which would be best for the city. Notwithstanding his wide business interests, his acknowledged superiority in the shipping field and his activity in city and political party affairs, he had the tender heart of a woman. No on ever heard Mr. Bray speak a harsh word. Gentle, kind and generous, he tempered his daily activities with the spirit of the broadest humanity. Both Mr. Bray and his wife appreciated the necessity of a higher education and when they moved to Grinnell their children entered the public schools, and passed through the entire course, graduating from high school with exceptional merit and promise. Their teachers recognized in them the gift which they had received from their ancestors, of devotion to their work, a beautiful and studious disposition, and perfect attention to the duties for which they were in school. Four children were born to Mr. and Mrs. Bray: Florence, now Mrs. M. W. Swisher of Grinnell; Katherine, now Mrs. Katherine Bray Haines of Des Moines; Edward J. Bray of Seattle; and Will H. Bray, who died several years ago. The wife and mother passed away at their home in Grinnell, July 24, 1911 and since her death Mr. Bray's home has been with his daughter, Mrs. M. W. Swisher. There survive him the three children named above and five grandchildren, Virginia Swisher of this city, Robert Haines of Des Moines, Haworth and Henry Marshall Bray, of Grinnell and William H. Bray, Jr., who lives in California. Thomas fought with honor in the following battles: Wilderness, VA, May 6-9, 1864; Spotsylvania, VA, May 12-15, 1864; Spotsylvania, VA, May 31, 1864; Bethesda Church, VA, June 3, 1864. Thomas was seriously injured in the upper thigh by a minie ball at the battle of Cold Harbor. His brother, Henry, carried him to the rear of the line so he could receive medical attention immediately. At dawn, on June 3, 1864, the II and XVIII Corps, followed later by the IX Corps, of which the 17th Regiment was a part, were in battle along the Bethesda Church-Cold Harbor line and were slaughtered at all points. 7,000 Union soldiers were injured or died. Grant later commented in his memoirs that this was the only attack that he wished he had never ordered. The 7th Regimental History includes the following report about this battle -- "On June 3, Griffin's brigade had the right of corps and held the extreme right of the army near Bethesda Church, and took no active part in the general assault of the morning. In the afternoon, in a movement of Griffin's brigade to support the First Brigade in an assault on the enemy's works, the regiment was on the extreme right and came into open field at right angles with the brigade line and fully exposed to the sharp enfilading fire of the enemy's skirmishers. A part of the regiment was detached and sent to the right to assist our skirmishers and the annoying fire was soon silenced. In front of the line was found a strong rifle pit filled with the enemy, and a masked battery. The brigade, not receiving the support expected on the right, withdrew, keeping up, meanwhile, a rapid fire. The loss of the regiment was one killed, seventeen wounded--five mortally." Lieutenant-Colonel Cummings in his official report says on June 8: "During these last 15 days, we have been under fire every day but 3, and 2 of these days we were on the march." According to National Archives Records, Thomas was sent immediately to USA General Hospital, in Washington DC. He stayed there until July 12, 1864 when he was admitted to Sloan USA Hospital, in Montpelier, VT. He returned to duty on April 29, 1865, after a hospital stay of 10 months. He was promoted from a private to a corporal on July 1, 1865, and mustered-out near Alexandria, VA, on July 14, 1865. He was due $240.00. A handwritten letter by Eldin J. Hartshorn, Captain of Company G, on August 31, 1865, gives great insight into the character of Thomas Bray. "While in the line of duty he was disabled by a musket ball passing through his right thigh, cutting off the cords, at the battle of Cold Harbor, Virginia, on the 3rd day of June, 1864, and I further say that after his wound, Thomas was sent to the hospital where he remained until this spring, when he returned to his company, hoping to be able to do something in the line of his duty, in the final stroke at the Rebellion, but was so disabled by his wound, gangrene having set in, when in the hospital, that he was wholly unable to perform military duty, and was examined for discharge, and sent to the hospital for that purpose, when the general order came discharging the Regiment." Another letter from the National Archive Records was handwritten by Marcus L. Reed, a Sergeant with Company G, who states: "when he joined the Regiment near Alexandria, VA, in June, 1865, was was in an emaciated condition and not fit for duty and had not business to be with us, but he was one of those chaps full of grit and sand and was bound to stick by as long as he could, although not fit for duty. He came to Burlington, VT, with the Regiment but was so low, that Surgeon Rutherford sent him directly home." After the war, Thomas worked on the family farm in N. Danville, VT. There he met and married Mary Elizabeth Coveney, daughter of Brainard and Mary Welch Coveney, on December 25, 1869. Their daughter, Mary Agnes, was born in 1874. Diphtheria struck down both mother and child: Mary Elizabeth, 23 years old, died June 8, 1875 and Mary Agnes, just a year and a half, died June 15, 1875. On September 18, 1876, in St. Johnsbury, VT, Thomas married Honora Teressa Farrell, daughter of James and Rosanne Hart Farrell. They became the parents of nine children: Thomas James Bray, August 31, 1877; William Michael Bray, August 14, 1879; Mary Lillian Bray, June 5, 1881; John Farrell Bray, November 23, 19883; Nora Gertrude Bray, May 6, 1886; Blanche Rosanne Bray, December 15, 1887; Estelle Florence Bray, October 19, 1889, all born in N. Danville, VT with the following children born in Grinnell, Iowa; Lisle Walter Bray, March 20, 1892, and Frances Isabel Bray, August 23, 1893. Thomas lived with his family in N. Danville, VT and farmed there until moving to Grinnell, Iowa, in 1891, where he entered the livestock business. In a 1967 tape, Blanche Bray Stiles give insight into the Thomas Bray family. She tells of her father singing in a rich baritone voice, and his love of fast horses, of her mother serving waffles and maple syrup on Sunday evenings to her family, and to any and all college friends who wished to come, of the astonishing fact that all five of the Bray sisters were college graduates, that her father 'took a cane' when he was tired and his leg bothered him. She tells of the severity of his war injury, that the doctors wanted to amputate his leg and that he wouldn't let them, that he passed the time in the hospital studying math, and became "quite a whiz." She tells of the affection the family had for each other, of their good times and assures us, "You would have loved the Bray family." 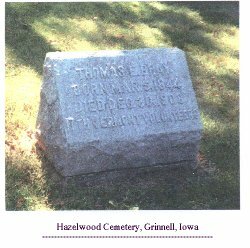 Thomas died in Grinnell, Iowa, on December 30, 1908, at the age of 64 years and is buried in Hazelwood Cemetery. According to the Grinnell Herald, January 1, 1909, "Thomas died after an illness of 13 months. He was a prominent member of the Gordon Granger post, GAR He was a member of the Catholic church all his life and was a man extensively engaged in the livestock business. This work grew to large proportions and all with whom he had dealings will bear witness to his high sense of integrity and honor. His word was always his bond." Grinnell lost an old and respected citizen last Wednesday when T.E. Bray passed away, aged 64 years. He had lived in Grinnell since 1890 and is missed by many close friends whom he has made during this period of 18 years. Death was caused by a mental and physical breakdown and followed an illness of thirteen months, during which time Mr. Bray has gradually grown weaker. During the period of his active life in this community, Mr. Bray was extensively engaged in the live stock business. His work grew to large proportions and all with whom he had dealings will bear witness to his high sense of integrity and honor. His word was always his bond. Thomas Edward Bray was born March 5, 1844, in Granby, Canada and died at his home in Grinnell, December 30, 1908. He was married on September 18, 1876, to Miss Nora T. Farrell at Wells River, Vt. Mr. Bray made his home in North Danville, Vt., up to 1890, when he moved to Grinnell and has been identified with the progress of the city every since. Thomas J., a lawyer in this city: William M., in the furniture business in Honolulu: Lillian M., teacher in Cooper school, this city: J. Farrell, court reporter for the Sixth district: Gertrude M., Blanche R., and Estella F., member of the class of 1910, Iowa College and Lisle and Frances, students in the Grinnell high school. In addition, Mr. Bray is survived by three brothers, Henry M. of Grinnell, John E., of Reno, Nev. and William J., of Hartford, Conn.
Mr. Bray was a prominent member of Gordon Granger post, GAR He served during the Civil War in Company D of the Seventeenth Vermont Volunteer Infantry and took part in the battle of the Wilderness, at Spotsylvania and Cold Harbor. In the latter battle he received a wound from the consequences of which he never fully recovered. He was a member of the Catholic church all his life and was a man of most exemplary habits, having never used liquor or tobacco in any form. The funeral was held in the Catholic church on Friday afternoon at 2:45. The Rev. Father Curtin conducted the services and spoke feelingly of his friend who passed to the other side. Suitable music was furnished by a male quartette. H. I. Davis, John Goodfellow, L. J. Carroll, J. M. Campbell, S. W. Belden and A. B. Gage were pall bearers. Kreigh Crney, Bernard Carney and Samuel O'Brien were ushers. Contributed by: Florence Cellini, Floral City, FL, great-grandniece of Thomas and Henry Bray.